Daniel Ricciardo says Max Verstappen's dominant qualifying record over him in 2018 has nothing to do with his Red Bull team-mate having "bigger balls" on Saturday runs. Ricciardo has only topped his team-mate twice on Saturdays this year and admits he has not fulfilled his potential in qualifying. Ricciardo has taken Red Bull's only pole position of 2018, having won Saturday honours in Monaco after Verstappen crashed out of FP3. However, Verstappen has qualified ahead in 13 races – including all but one since the Monte Carlo race in May – and outqualified Ricciardo 13-7 last year. 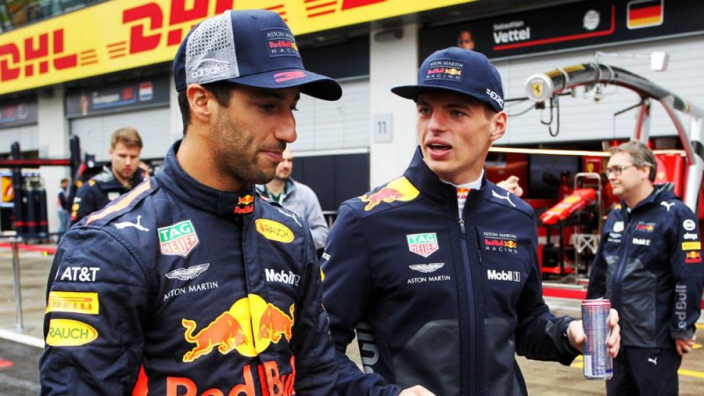 Although Ricciardo says he has been left with regrets from qualifying this year – he does not believe that Verstappen has held the wood over him because he is more daring. "Through last year I wasn't that happy with my qualifying," said Ricciardo. "I thought the start of this year we started to improve some things. "I haven't really got everything out of it, or maybe Max is just getting a lot better, I don't know. I'm not done yet. "Honestly, not taking anything away from Max – for sure he's fast and he's been driving well – it's not necessarily that he [had] bigger balls in that corner or whatever. "I feel like we kind of got left a bit last year as well. Some qualifying [sessions] I'm like 'should've done that' in terms of 'should have gone up on the front wing six clicks instead of one or two'. It's kind of been stuff in hindsight. "I'd like to be more pro-active on some tings but more set-up. I feel just a lot of the time we understand it but it's too late. I guess we're still learning. But obviously he's been getting on top of it more than I have."